Now's your chance to visit this upscale & authentic Adirondack cabin with stunning vistas directly on Lake Champlain. Deep breath... Crisp air & sunshine, solitude and relaxation await you! Combine rustic luxury with magnificent vistas; all while you relax directly on the shores of Lake Champlain. Surround yourself with crystal clear waters and stunning sunrises as you swing lazily in a lakeside hammock. Your dream getaway starts here! Sleeps 4 adults and 2 children... We bring you true Executive Adirondack-style direct waterfront living on lovely Lake Champlain. The views are spectacular in this romantic, private and peaceful home. Our cabin has newly equipped central air conditioning to make your summer stay extraordinarily comfortable. Glass windows from floor to ceiling overlook the lake and offer spectacular views. Our “little slice of heaven”, is the perfect cabin to meet all your needs. Comfortably furnished, with two full sized beds in the open loft; in addition to, an Adirondack bunk room for children. Sleeps up to 4 adults and 2 children which allows for either your perfect romantic getaway or an ankle-biter family vacation! You decide! This cabin is fully furnished from top to bottom and includes a 46" flat panel TV, well-stocked kitchen and Keruig coffee brewer. Cable, Chromecast, internet and wifi, are also included. Newly remodeled with cathedral ceilings, knotty pine interior, and hardwood floors. A modernized kitchen combining granite counter-tops and stainless steel appliances bring you rustic charm with modern comforts. Newly renovated and fresh full-sized bathroom offers clean and comfortable amenities. Full Washer/Dryer are on premises. A wrap around porch and hammock provide perfect views for watching all the on-lake activities. A gas grill, outdoor fireplace and stairs to your own private lakefront access make this a wonderful place to relax and recharge your batteries. Private direct lakefront access is a gradual slate entry. Coastline is ever-changing with variable lake levels dependent upon the season and precipitation during the year. Swimming is wonderful and right outside your door; accessible via stairs to the lake. All water sports including kayaking, fishing, and stand up paddle boarding can be done from your own exclusive shores. This site also includes an onsite garage and shed for storage of water toys and bikes. A perfect U-shaped driveway make this a favorite stop for those pulling boats and boating toys. Easy access to power outlets within the garage. In particular, the bass fishing tournament community have found this very appealing. 100% Non-smoking. Dogs are not preferred but may be considered on a case by case basis. An additional fee and deposit will be assessed. Bring your bikes to tour the peninsula known as Cumberland Head or walk-on the Grand Isle ferry and tour the Grand Isle bike paths. Wilcox Dock Boat launch is located approx 5 miles away as are multiple others in the area. A Kayak is on site and available. The Kayak Shack also rents kayaks and stand up paddle boards along with drop off and pick up service for your convenience. 45 min to Lake Placid, 1hr to Montreal, 90 min to Lake George, 30 min to Burlington, VT., Walk to Grand Isle Ferry. 10 minute drive to Plattsburgh State University. Ambitious and accomplished, we are an industrious duo that function as a well-oiled machine. As high school sweethearts, we grew together on the shores of Lake Champlain, then journeyed to Washington D.C. for a fresh start. We have lived the urbanite dream for nearly two decades and raised a handful of ankle-biters (yes, five!). We are able escape to our special home often, but also would like to share it with others. When we receive great reviews about our "little slice of heaven", it truly warms our heart! We feel so delighted to share our special place with the world. Ten years ago we decided to purchase a cabin on beautiful Lake Champlain in order to be closer to family. Our family has spent every summer this past decade enjoying the ups and downs of transforming this once dilapidated cabin into a rustic retreat. Post-purchase, it quickly became clear that our hopes for spending time at a relaxing getaway were a bit misguided. This project-after-project lifestyle offered us the inspiration we needed to name our cozy lakefront cabin: an ironic, ‘Serenity Now’. Her name, derived from the comedic sitcom, Seinfeld, which once featured an overworked man exclaiming ‘serenity now’ amidst a variety of stressful circumstances. Our family, especially our five kiddos, found themselves affectionately adopting this phrase. With herculean effort, we have transformed this challenging fixer-upper into a modern Adirondack-style escape. We are exuberantly proud to share her with all of you. 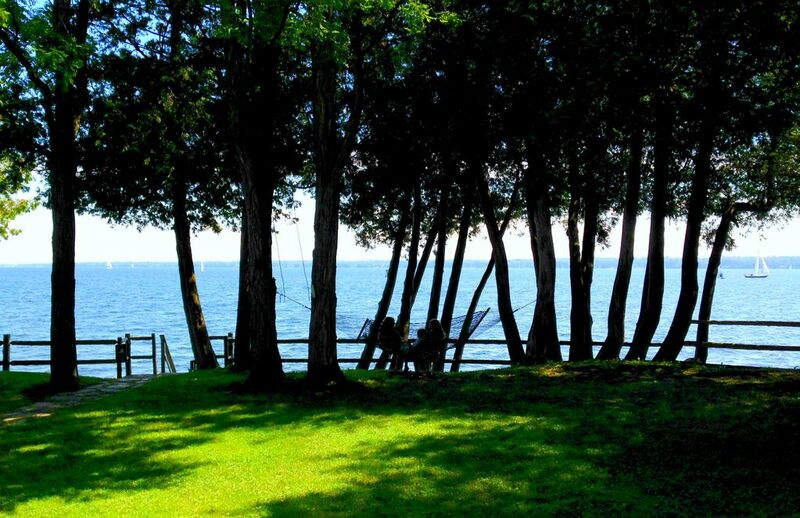 Serenity Now is directly lakefront as opposed to many area properties with a road barrier to Lake Champlain. You will find the lake by opening french doors and following a beautiful slate walkway down to a second deck overlooking the lake. We have tried hard to preserve the authentic nature of our Adirondack cabin. Guests truly feel transformed to someplace magical and serene. At Serenity Now, you are surrounded by all things beautiful and rustic. Our home is clean, comfortable and modern. There really is no "roughing it" despite the rustic surroundings and so we appeal to even the most discerning of vacationers. Brand new central ductless system installed Summer 2017. Bathroom towels included... Beach towels are not included. Complimentary Kayaks and SUP can be used with proper PFD. The lake house was such a perfect place to enjoy the lake and close to everything we wanted to do! Jennifer was so welcoming and the house was so cozy. We took the kayak out on the sunny day, and made a fire that night, and on rainy days we just loved gazing at the lake and relaxing. Sunrises were beautiful. I don’t see how there would be a better place to stay in the area; this little house was absolutely perfect. Beautiful cottage, loved the gel fireplace and the sofa facing the lake in the morning ! It is a peaceful place with beautiful scenery nearby perfect for fall leaf drives, both in New York and Canada. Perfect size for one couple(or two couples if one couple can do bunk beds!) or a couple of kids. A sofa bed in the living room would be a great sleeping addition. We plan to return in the future, for sure !!! Jennifer, our host was very attentive and provide great information about the cottage and the sea that was very helpful!! fall colors at almost peek time. Stayed the last few days of sept.. and the first 5 days of oct. The house is cozy with a great view of the lake. watched the sunrise every morning. Went to Montreal, Vermont, New Hampshire, Lake Placid and the Chasm.. Wish that there was more lighting in the house, but i would not hesitate to rent here again. ps; it would help if there was some kind of marker at elevation changes in the floor. had a couple of scarey moments. Well appointed cabin with stunning views of the lake. A wonderful place to get away and enjoy a stay at a terrific house right on the shore of Lake Champlain. Just steps to your own private beach with a host of recreational water craft to utilize or just sitting on the shore taking in the view of the Vermont mountains. Clean, comfortable and quiet, the ideal place to enjoy the beauty of this area. Ideally located to all that the north country has to offer. It was wonderful to have you stay with us and we are so happy you enjoyed your stay. I'm glad you enjoyed the complimentary kayaks and stand-up paddle board.... nothing more relaxing than paddling and exploring the lake shore. We would love to have you visit us again. Best wishes. We loved our stay at your cabin. The view is beautiful and it was so easy to relax there. We chose your cabin for our honeymoon! We were looking for somewhere we could go and relax and that’s what we did. We loved all the little decorative touches in your cabin that made it feel like home. We had a fire in the fire pit every night, enjoyed the beautiful view and relaxed in the hammock. My husband cooked most of our scrumptious meals. We also really enjoyed our hike at Ausable Chasm and recommend two restaurants (Butcher Block and Happy Pike). We are so happy you choose to spend your Honeymoon with us. I'm glad you had a pleasant and relaxing stay and enjoyed the fire pit. Nothing more relaxing than a campfire overlooking Lake Champlain. Please email me for longer, shorter or last minute stays. Holiday rates are higher, may have a longer minimum stay, please inquire Watercraft is available for use May 15-Nov 1 only. No entertaining at this cabin...no more than 4 adults on the property at any time.